The Mastiff, or English Mastiff, is the largest and oldest of the Mastiff breeds and most likely the distant relative of many of today’s working breeds. From as far back as the 7th century BC this breed has been protecting its master and family. In spite of their size, it is rare that a Mastiff would actually attack a person, more likely, they would “hold” the person down until told to release them. This breed has a short coat making it easy to groom, and it comes in fawn, apricot or brindle with a black muzzle. Today’s Mastiffs enjoy a roll as a faithful family companion and home protector, preferring to be with a child or family member rather than sleeping alone. Mastiffs have been seen in many movies such as The Sandlot I and II, Marmaduke and Hotel for Dogs. The heaviest dog on record is a Mastiff from England who tipped the scales at 343 pounds. The AKC recognized the Mastiff in the Working Group in 1885.We combine our Tiny Ones series of hand painted, breed specific figurines with our winter Sleigh Ride Scene decorated tea cup to create a delightful three dimensional ornament perfect for any special occasion like birthdays or Christmas. 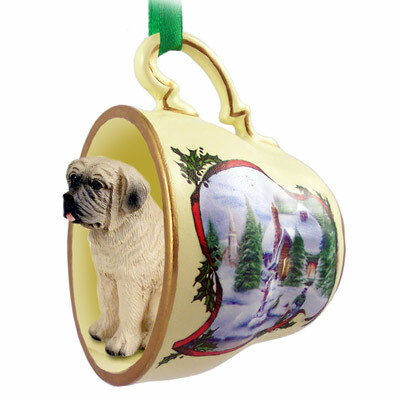 Great item to hang on your Christmas tree or an everyday display as well! Each tea cup is 2” tall and 2 ½” wide with a molded handle which has a green ribbon tied in a bow! The tea cups are even decorated with a gold toned rim and decorative stripe on the handle. On the outside, both sides are decorated with a tiny delicate winter holiday scene including a winter sleigh ride thru the snow and pine trees, plus berries and leaves. These unique items are stone resin and individually blister packaged, ready to give as gift or hang in your store. PLEASE NOTE- Sturdy metal Display stand (OH1) is available; see the tea cup display category!